robert pattinson | Wanna Catch a Movie? 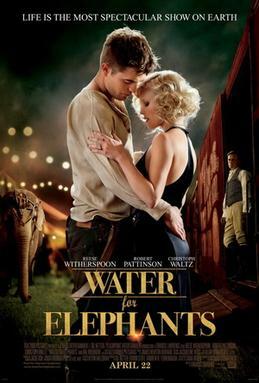 Robert Pattinson, Reese Witherspoon and Christoph Waltz star in the circus themed film, Water For Elephants. When an elderly Jacob Jankowski (Hal Holbrook) arranges to meet his son at the circus to watch a show, he fails to turn up leaving Jacob alone. Two concerned workers take him in out of the cold and in passing, Jacob mentions that he used to be a part of the infamous Benzini Circus in 1931, which sparks their interests immediately. We are then taken back in time as he tells the story of how he came to join the notorious circus and the eventful happenings that came about because of it. The film is very predictable. From the start when Jacob tears up looking at an old photograph, you know where this story is heading. There are no real gripping elements to the film and I felt quite bored throughout. The only times I felt more inclined to watch was when Rosie the elephant (Tal) graced the screen. She is a beautiful creature and the messages of animal cruelty in the film are well conveyed through her. You do start to feel sorry for the helpless state she is in and root for her safety or freedom, but then who wouldn’t, it’s only natural. Though it is a bit discouraging when she performs circus tricks in the film. No matter how much the makers of the film stress there was no animal cruelty on set, she would have undoubtedly been ‘trained’ to perform in such a way beforehand. Some of the disappointing factors of the film include the actors themselves. Pattinson seems to have missed his mark again. I didn’t quite get the feeling of a great actor or a special talent from him, which is a little disappointing. When I first saw him in Twilight I felt this too, yet due to his character being vampire it was plausible that he was just doing a great vampire impression – withdrawn, emotionless and stiff. However then came his role in Remember Me, which was much of the same, and Water For Elephants in my eyes wasn’t much better. Hopefully he is just trying to find his footing in the very diverse and demanding industry of acting, if not, I guess there is always the vampire genre for him to fall back on. Aside from Tal the elephant, I felt that Witherspoon and Waltz who play Marlena and August respectively, saved the film. They are both great actors and the chemistry between them was unnerving yet captivating to watch. Their marriage is full of angst and pain, which is overridden by love, though wearing increasingly thin. The tension they create brings with it a suspense which without, the film would’ve fallen flat. The elephant is great and Pattinson is his usual, introverted good-looking self. With Witherspoon and Waltz in the mix too there are a few reasons to watch the film. If you have a spare 2 hours why not, but I bet you can guess the ending within the first 5 minutes. This entry was posted in Film Reviews - W and tagged 2011, 6/10, benzini circus, christoph waltz, circus, elephant, film review, reese witherspoon, robert pattinson, rosie, tal, water for elephants on June 9, 2011 by Jen Horsman. When two young New York lovers begin a wild romance, little do they know the profound impact they will have upon each other’s lives. Robert Pattinson and Emilie De Ravin star in this romantic drama, written by Will Fetters and directed by Allen Coulter. Knowing that this would be his first chance to break out of the glittery vampire mould that the world knows him for, we see Pattinson pull out more acting skills than we have previously in the Twilight Saga. It’s the best performance he has given of his short career so far, and hopefully a glimpse at the potential he holds for his upcoming movie roles. When Tyler (Pattinson), a scruffy, rebellious rich kid is dared to date Ally (Ravin), the daughter of a cop that he recently got into a scrap with, he doesn’t anticipate that he will develop any true feelings for her. Little does he know though, this is a key component for clichéd romantic movies; star-crossed lovers. They share similarities in having broken homes, daddy issues and the death of close a family member. Tyler’s older brother Michael committed suicide a few years back, and Ally’s mother had been murdered when she was just 11 years old. Through Ally’s high spirits and attitude toward life though, Tyler finds some sort of understanding and begins to heal, finding happiness and meaning to his life again. There are many broken relationships in this movie, but most notably the one between Tyler and his father, played by Pierce Brosnan. Charles Hawkins is a very business-centred man that seems to have little time for his family, believing that being a provider for his children’s needs will suffice in his fatherly duties. Although we didn’t see his relationship with his children before the death of his son, he is made out to be bitter, careless and unforgiving due to this, often taking his anger out on his children and thinking he can buy his way back in. The acting in the film isn’t Oscar worthy, but it’s not terrible either. It’s good to see Pattinson move his face and actually convey human emotion, and no matter your views on Twilight, don’t let it deter you from seeing this film. In parts it can be a bit slow paced, making you question if the film is even worth watching, but occasional sparks in the acting and dialogue keep you engaged. Acting credits must go to the fantastic Ruby Jerins who portrays Tyler’s younger sister, Caroline. The chemistry between her and Pattinson feels very real. Their relationship grounds the movie and pulls focus from the romanticism between him and Ally, allowing for a normal and pure love between family to be felt, obviously stronger since the passing of their brother. It isn’t until the last 10 minutes of the film that the true twist is revealed though. The initial premise stages the film as yet another struggle for love, a script we see time and time again. However, it’s only at the end of the film that the underlying message is delivered, with no warning, in a turn of unprecedented events. The final scenes of the film are no way hinted at throughout the movie, definitely making it worth a watch. It is sure to leave audiences with goosebumps, and perhaps a different outlook on life. 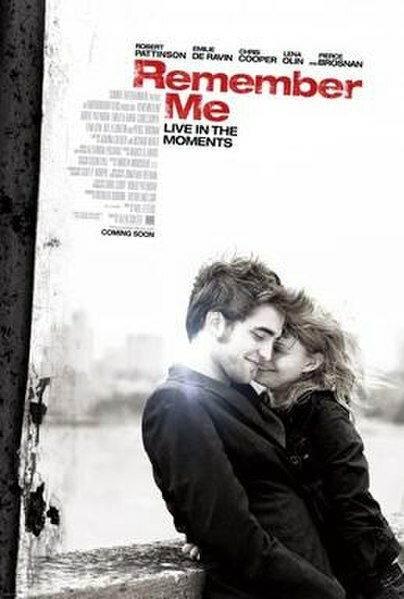 This entry was posted in Film Reviews - R and tagged 2010, 6/10, emilie de ravin, film review, pierce brosnan, remember me, robert pattinson on April 26, 2011 by Jen Horsman.